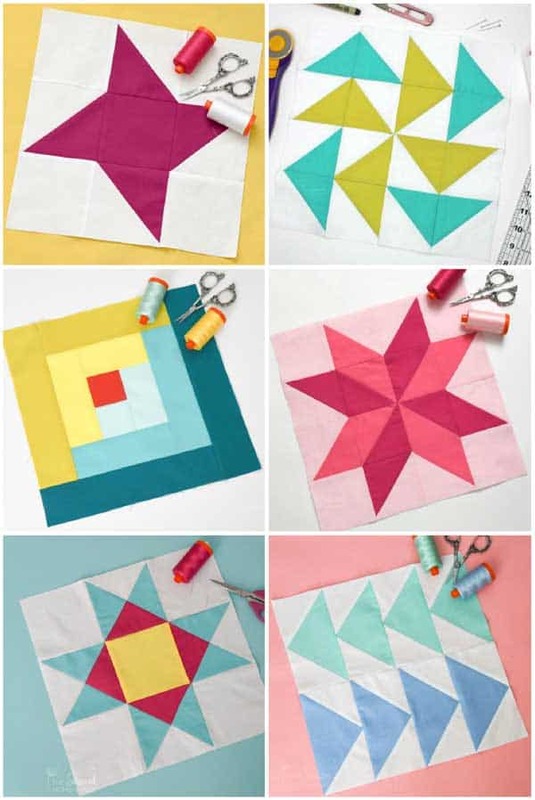 The Twin Star Quilt Block is a variation of the Friendship Star block and is ideal for beginning quilters. At its core, it’s only a 9-patch block that uses a split quarter square triangle, which I will demonstrate below. This is a great block to make because it’s so versatile, and has the added bonus of improving your skills while you learn a new technique. 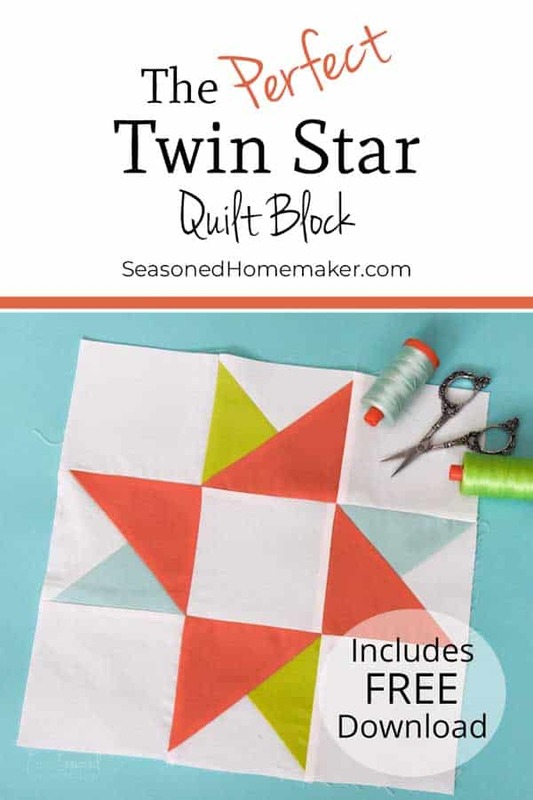 I tried to do a little research on the Twin Star Quilt block and couldn’t find any historical information, but I know you’re going to love how easy this quilt block is to make. And be sure to grab the FREE PDF instructions below. This block is very economical. I used some solid fat quarters that were in my stash. As long as you choose fabrics that have a contrast, anything will work. Take the white (D), green (B), and turquoise (C) squares and with a pencil make two diagonal lines from corner to corner. Cut along these diagonal lines. This will give you 4 white triangles, 4 green triangles, and 4 turquoise triangles. Note: You only need two green and two turquoise triangles, so set aside the remaining triangles for a second block. 2. Take the two orange squares (A) and with a pencil draw one diagonal line. Cut along this line. You will have 4 orange triangles. It’s very important to pay attention to the orientation of your green and turquoise triangles. This will matter when assembling your block. Before stitching, it’s a good idea to layout the triangles as seen in the Step 4 diagram below. I also recommend lowering your stitch length slightly (2mm) and using a walking foot or dual feed. 1. 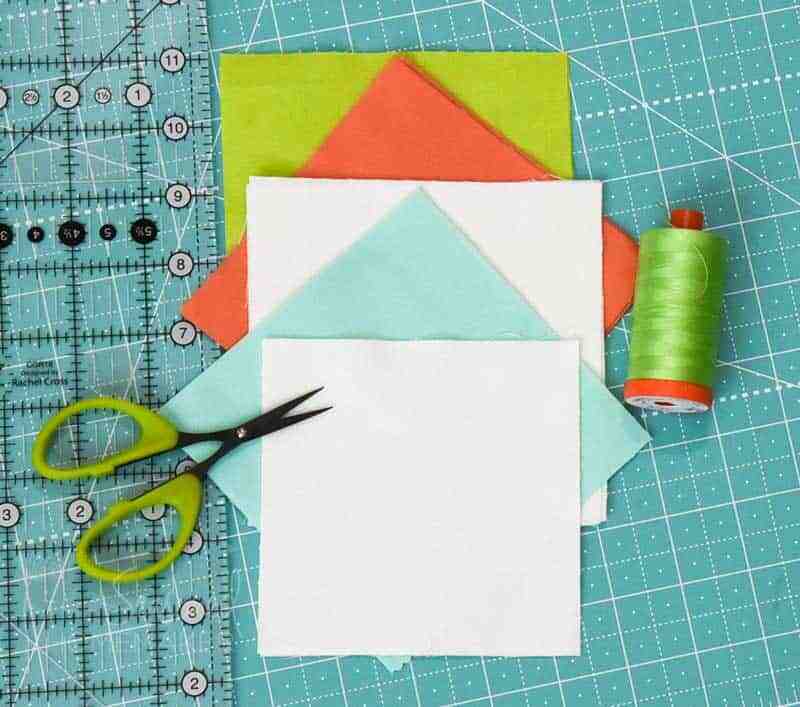 Take one turquoise triangle and one white triangle and stitch together. Repeat. 2. Take one green triangle and one white triangle and stitch together. Repeat with the remaining green triangle and the two turquoise triangles. 3. Trim away dog ears and press seams towards the dark fabric. 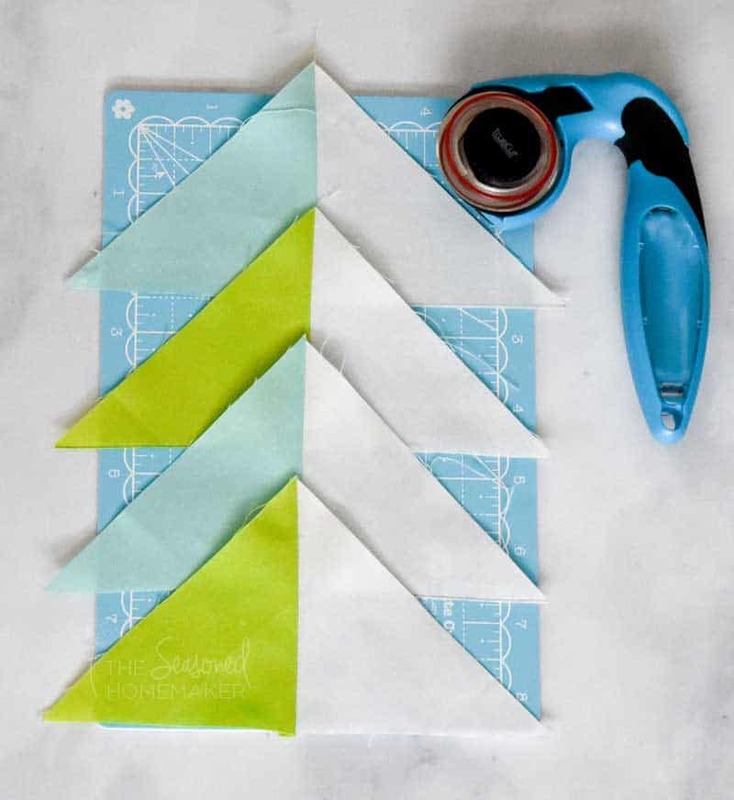 Pay attention to the orientation of your green and turquoise triangles when assembling SQSTs. See the Step 4 diagram below. 1. 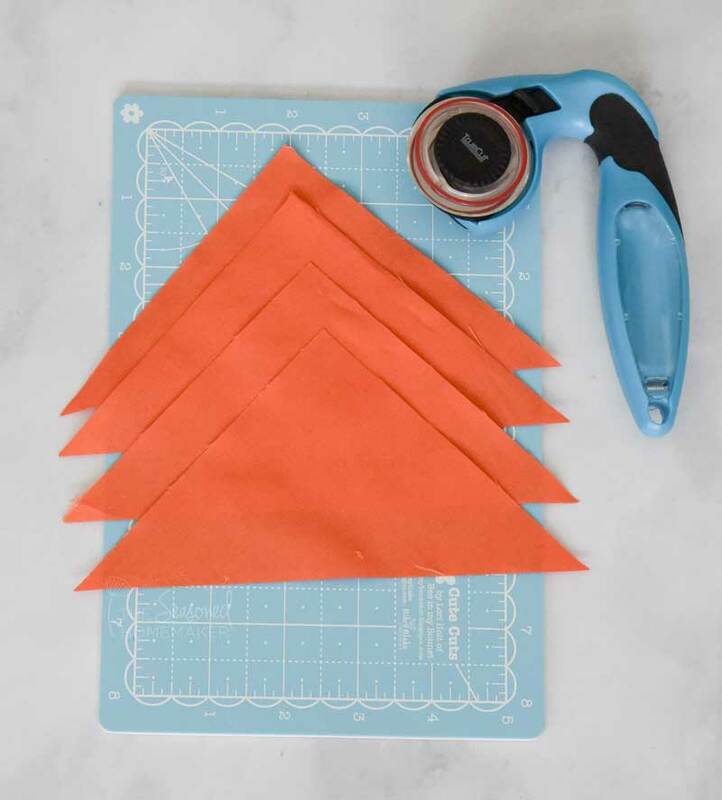 Take one green/white triangle set and attach to one orange triangle. Press towards orange fabric. Repeat. 2. 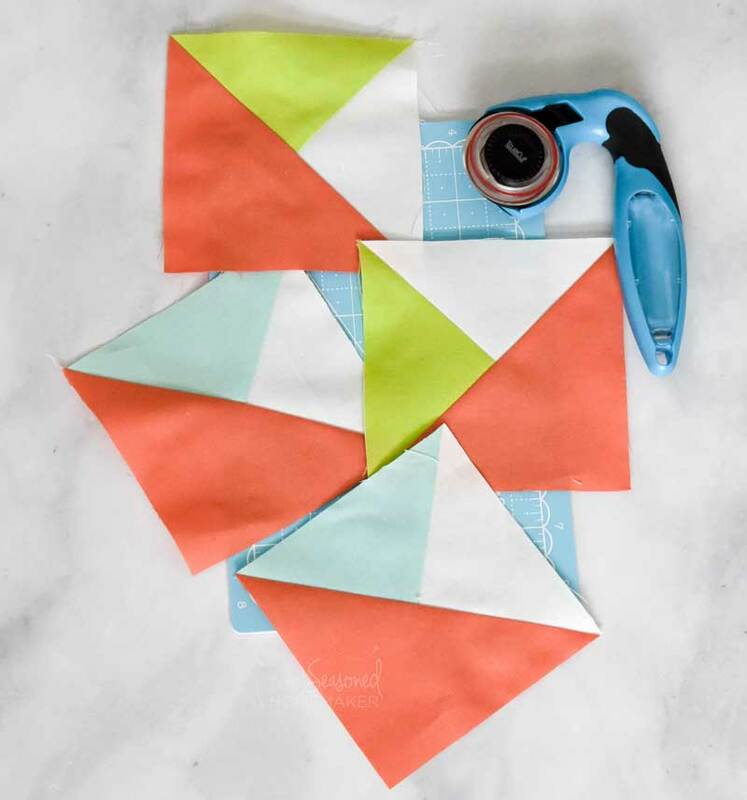 Take one turquoise/white triangle set and attach to one orange triangle. Press towards orange fabric. Repeat. 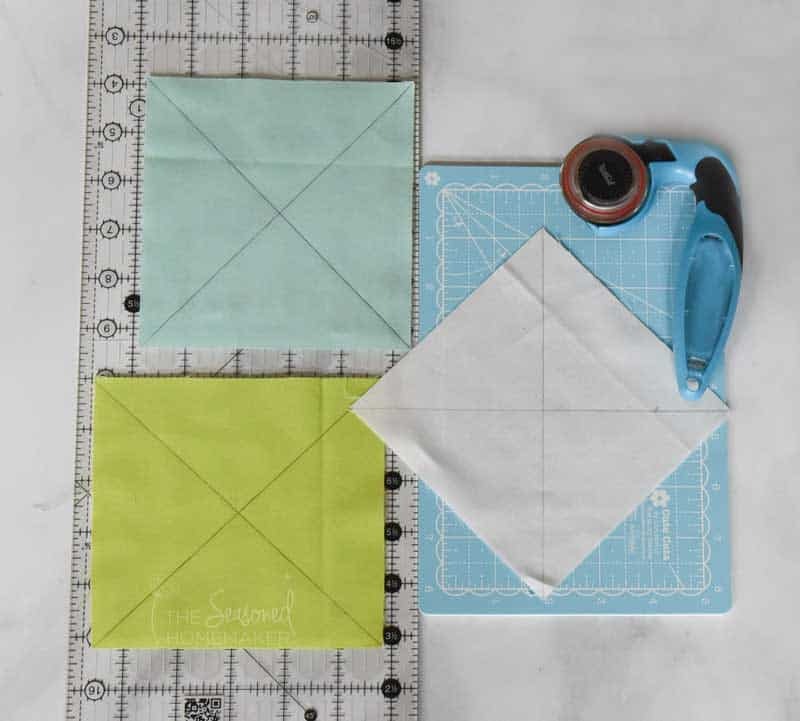 You should now have two green/white/orange squares that are 4 1/2″ and two turquoise/white/orange squares that are 4 1/2″. Trim to size if necessary. 1. Arrange your blocks and SQSTs in correct layout (pictured below). 2. 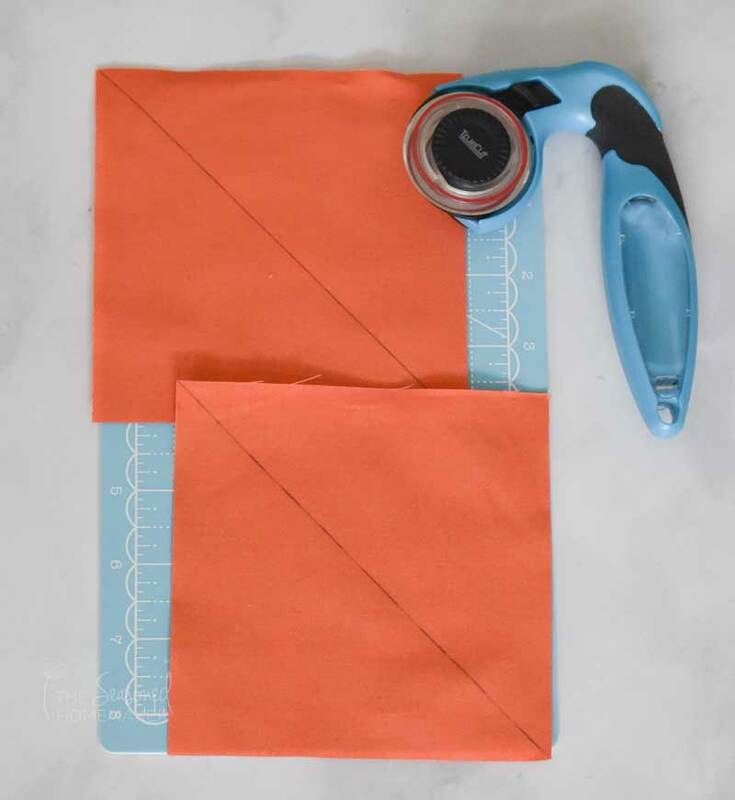 Using a quarter inch seam allowance, sew together across in rows. Press seams in same direction on each row. Alternate pressing direction on each row. 3. Join all rows lengthwise, using a quarter inch seam allowance. Take time to nest your seams. 4. Press your completed block and trim down to 12.5″ square (if necessary). This entire tutorial is available in a FREE downloadable PDF. Please follow the directions in the red box below and it will be sent directly to your inbox. Note: Current Subscribers can re-enter their email but won’t be double subscribed. 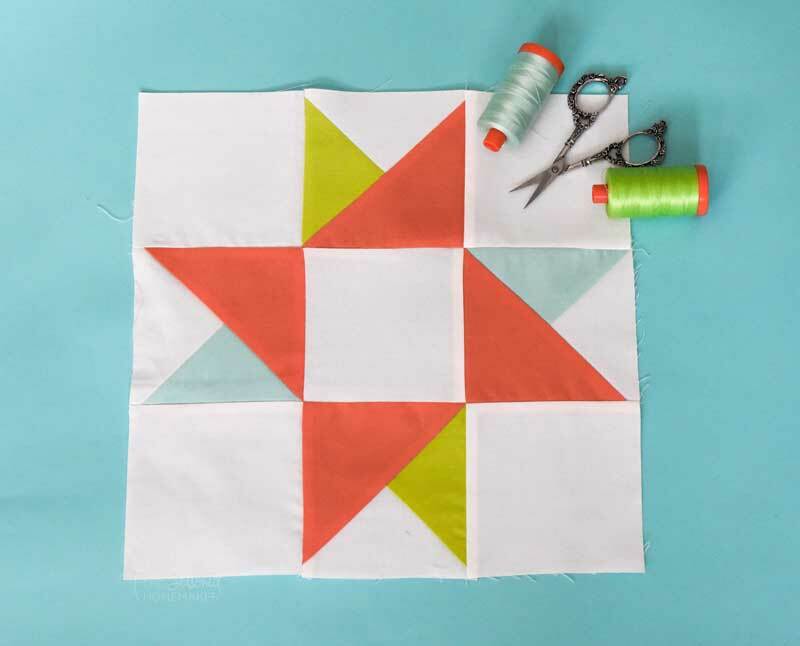 Don’t you love the Twin Star Quilt Block – especially the simplicity. Try a different look by using small prints. Make each of the “stars” out of a different fabric from a collection. Or, try using low volume fabric for the background. 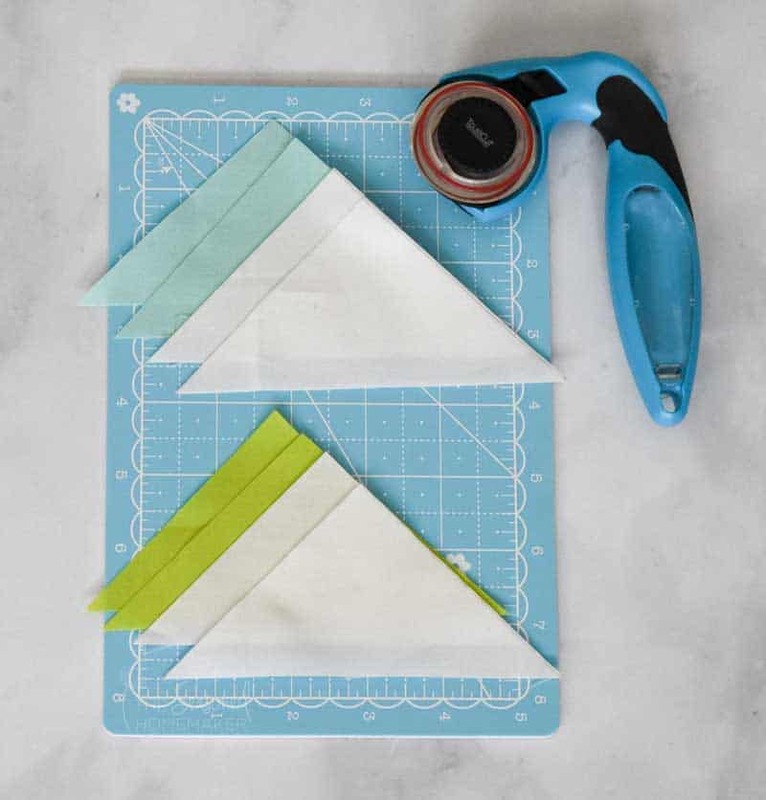 Better yet, the options for this simple quilt block are fun to imagine! 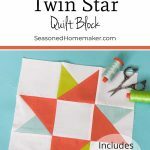 This is ideally suited for a pillow or you could make several more Twin Star blocks for an entire quilt or piece three or four together for a nice table runner. 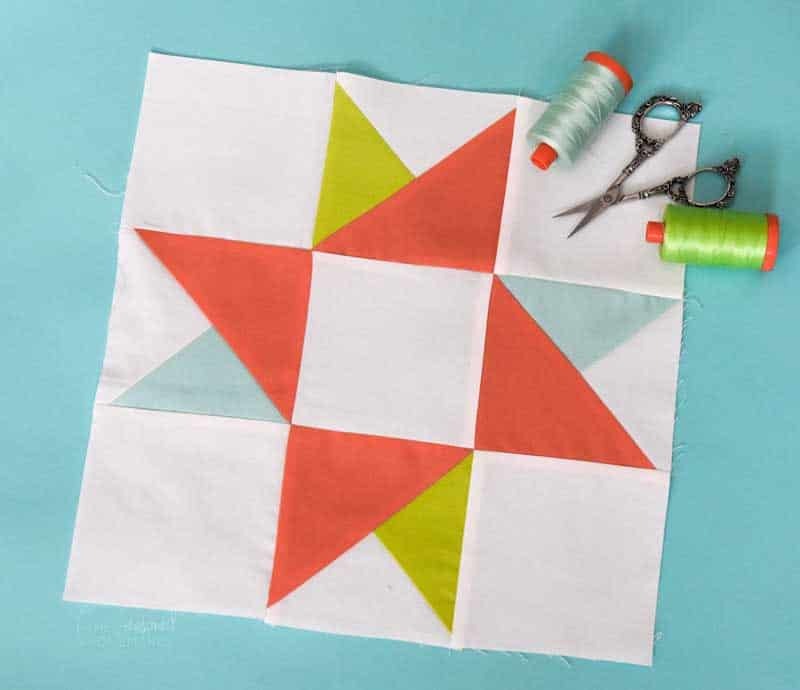 The Twin Star Quilt Block is a fun and simple quilt block. I hope you make lots and lots of them. Did you like this post? Check out a few of the other Quilt Blocks in this Series. Sorry, but it seems redundant that you have to enter email address again, and again, and again to get PDF when you could simply add link to your blog. I am working on a different plan, but it takes a lot of time to set these up. It is a process than I am working on but involves developers who have long lists of clients. 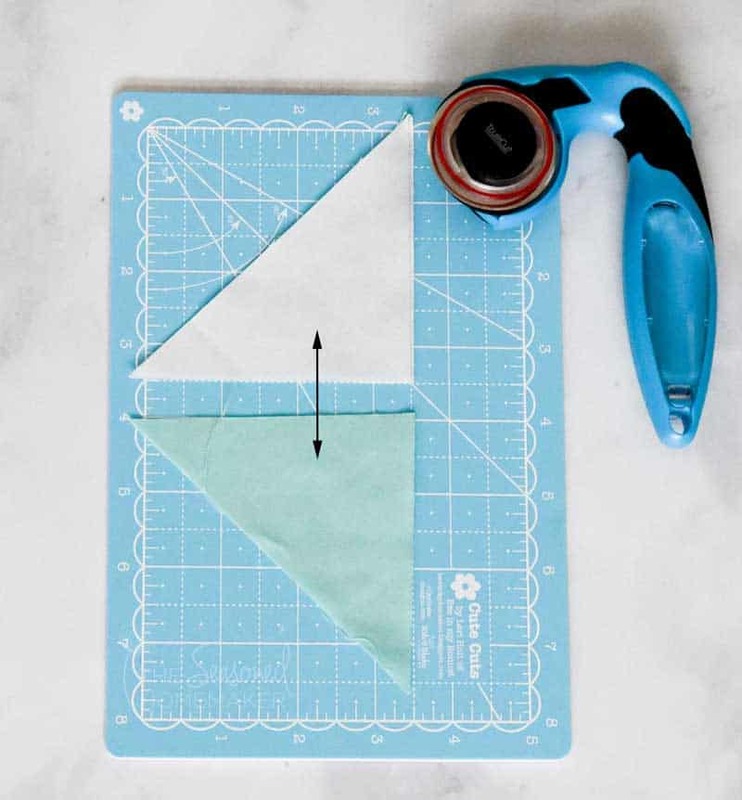 When quilt pieces are cut on the bias it’s recommended to use a walking foot to keep the seam from stretching when being sewn. Thank you for this pattern I am looking forward to trying it. You are so generous to offer free patterns the way you do. 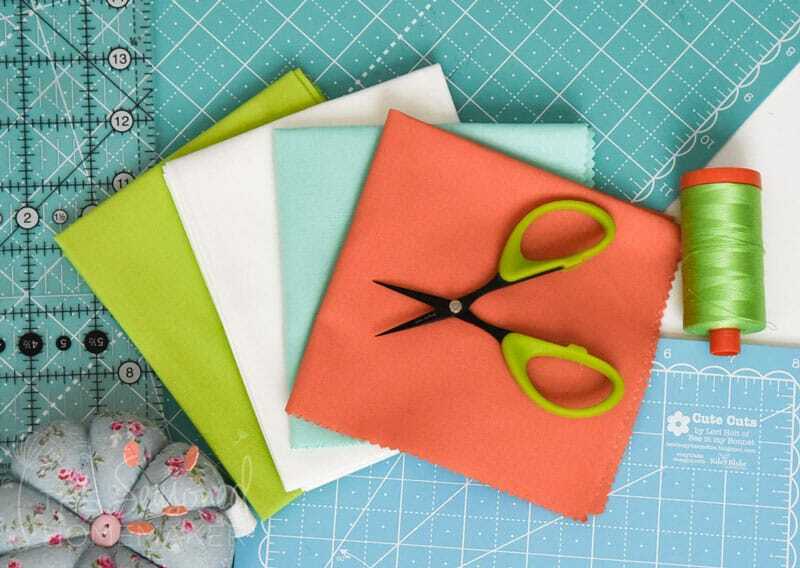 I am a new quilter and the way you teach is so helpful. Thanks for the tutorial and PDF pattern. I’ve been looking for a gift idea for my DIL’s birthday and a runner with these blocks would be perfect! I am a new sewer and appreciate all the information and patterns you provide. It’s like getting a little gift every day and always makes me smile! Thank you for the free pattern, and the great tips. I really appreciate your expertise! Welcome, I'm Leslie. 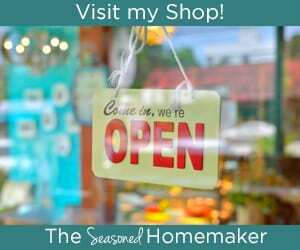 Here at The Seasoned Homemaker every day can be extraordinary when we Celebrate Creativity together! To read more, click here.